The Dallas/Fort Worth Metroplex is known for having many of their high school football stars go on to make it to the highest level, the National Football League. This year was no exception with three of the top six sections in the NFL Draft all from the DFW. 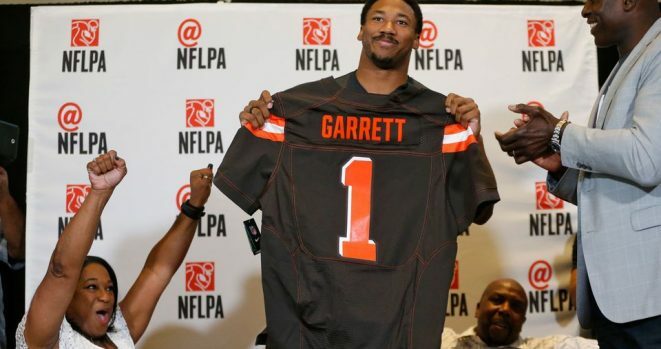 Arlington Martin’s own, Myles Garrett out of Texas A&M was the #1 overall draft pick going to the Cleveland Browns. Garrett was followed by Solomon Thomas of Coppell going to the San Francisco 49ers at #3 and Herbron’s Jamal Adams being taken #6 by the New York Jets in the first round. Other area standouts selected were Daeshon Hall (Lancaster / Carolina Panthers – Round 3), Davis Webb (Prosper / New York Giants – Round 3), Howard Wilson (DeSoto / Cleveland Browns – Round 4), Deatrich Wise Jr. (Hebron / New England Patriots – Round 4), Sam Tevi (Trinity / Los Angeles Chargers – Round 6), Josh Carraway (Flower Mound / Tennessee Titants – Round 7) and Kyle Fuller (Wylie / Houston Texans – Round 7).